I know, where the heck is Moodus anyway? Moodus is short for the Native American word "machimoodus" which means "the place of bad noises". Not to worry because we are 3 miles from the fault line and the last major earthquake was on May 16, 1791! I hope we are not overdue. Although, we did have a small one in 2015 a half mile away but we slept through it. Having viewed this forum for several years I bravely decided to add my name to those on the other side of the tracks. 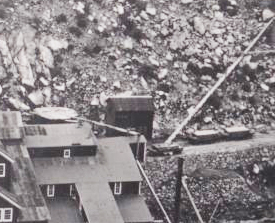 the Iron City/Penn (Rose-City Ore Company) mill in Black Hawk and some mines in the Clear Creek area. Though freelanced, I am trying to use mostly C&S buildings and bridges to get the general feeling of the area. 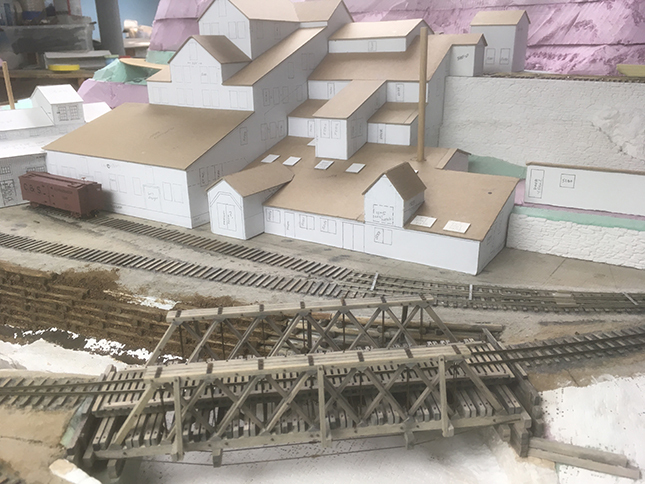 I have built a cardboard mockup of the mill as it appeared in 1918 which comes out roughly to 3 feet in HO scale (yikes!). I imagine the ore cars will be pulled by horses at this point or the Fordson used by the mill. Rail will be code 55 on handlaid ties for the C&S with Gilpin mill trackage code 40.
and all ties have been laid but only a short section of rail (This winter's project). 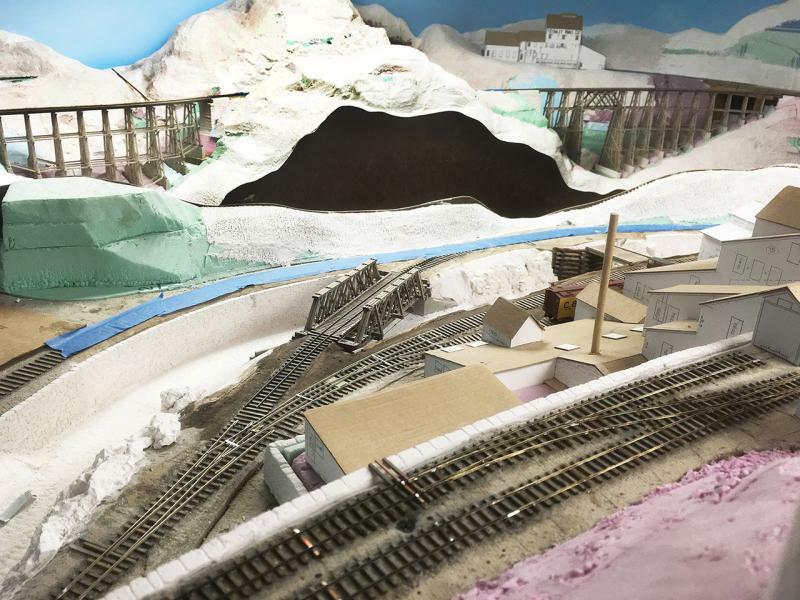 The 13 x 21 layout is in the basement and some scenery has been started with foam board and sculptamold. I have been following Keith's forum on the Gilpin and since he is getting close to my mill I figured now was the best to join. I partially started and stopped two layouts in my younger years but family life kind of took over. Now I finally have some spare time to really do something. And yes, I am hoping to prove to everyone that HOn3 C&S engines can really run! Anyway, thanks for letting me join. ... or even a bit of 3' ! ... in fact some say Keith is the horse ! Keep us posted on how your project is going Kevin. Hello Kevin, and welcome to the farm. Great bunch here, only a very few bite. How about posting a few photos of those buildings that you have already built, or started? We love to see photos. Some folks have trouble posting them, but at the beginning of Freerails, there are several different methods outlined. If, after trying them, you still have problems, we will try to help out. Is there any way I can move this thread I had already started when I first joined? 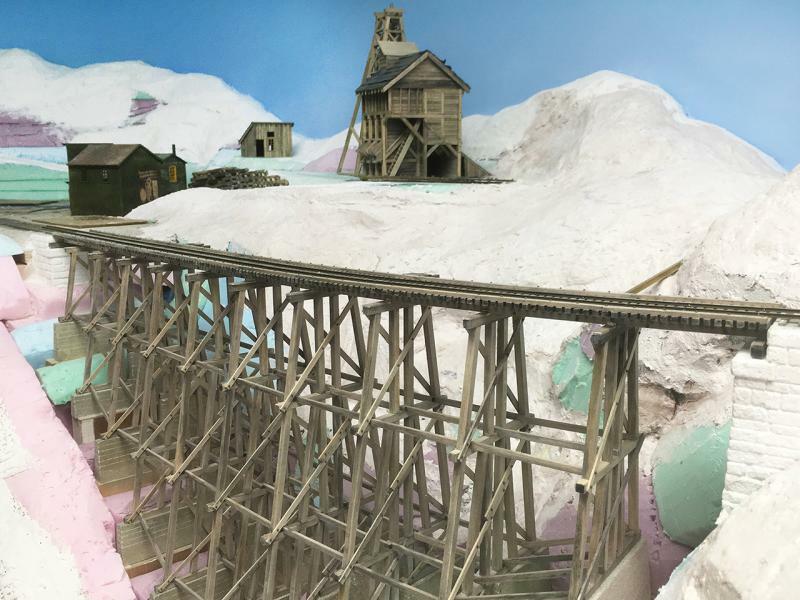 I wanted it in the "Narrow Gauge" forum and because I didn't know what I was doing it ended up in the "Joining Freerails" forum. Otherwise, I will have to start a new thread so it will be in the correct place. 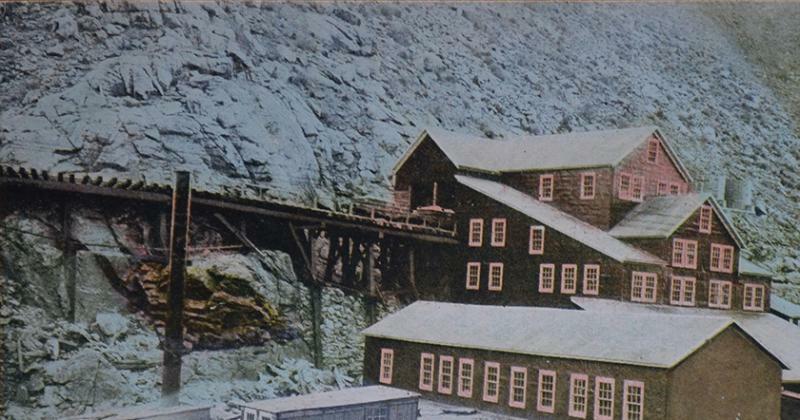 Here is a colored postcard of the mill that I found several years ago. After I saw this I knew I had to model it some day. Several years went by and then The Gilpin Era book came out by Sundance which filled in most of the other views of the complex. 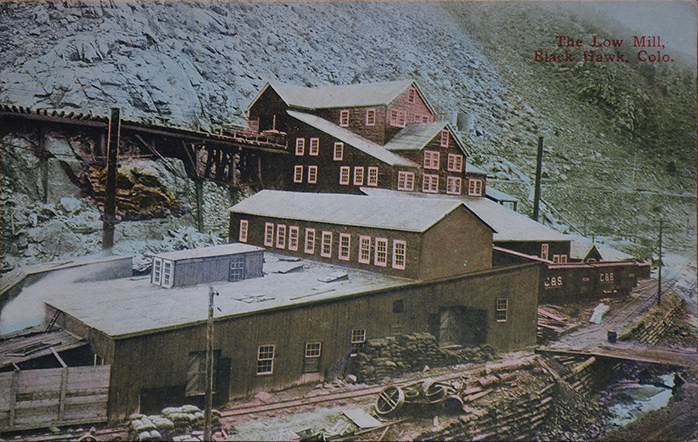 On this postcard it is called the Low Mill which is what I thought it was called before I saw the Sundance book. Perhaps because it was in lower Black Hawk and the locals called it that? Not sure. The cladding seems to stand out a bit more on the upper story. I don't know if that helps identify it more as metal or tarpaper. The trestle was always interesting to me. The center posts form a V which seemed to be pretty unique to me. Narrow gauge trestles use 1 foot diameter posts for their trestles. Any guesses as to what the Gilpin might have used? Do you think 10" or 8" posts might have been used as they would have had to support less weight although the cars were loaded with ore? I figure the ties are 5" x 5" as on the rest of the railroad. I am curious as to what the tall little building at the top of the mill was used for. There are three windows and no apparent door for personnel to enter. Maybe it is on the other side closer to the mill where in winter they can make a quick dash back to the mill! Also there is some sort of horizontal bar on the end with what looks like support posts. Anybody have any guesses as to what that is? Can't model it unless I know what it is! The mill has two tanks. One tank up on the hill with a pipe leading down to the top of the Gilpin grade. The other from a tank on the backside of the mill with a pipe leading across the tracks and into the back of the power house. What were these two tanks used for? And what size do you think the pipes might have been? 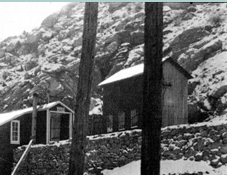 after the Gilpin had been abandoned but the mill was pulling the ore cars using horses. 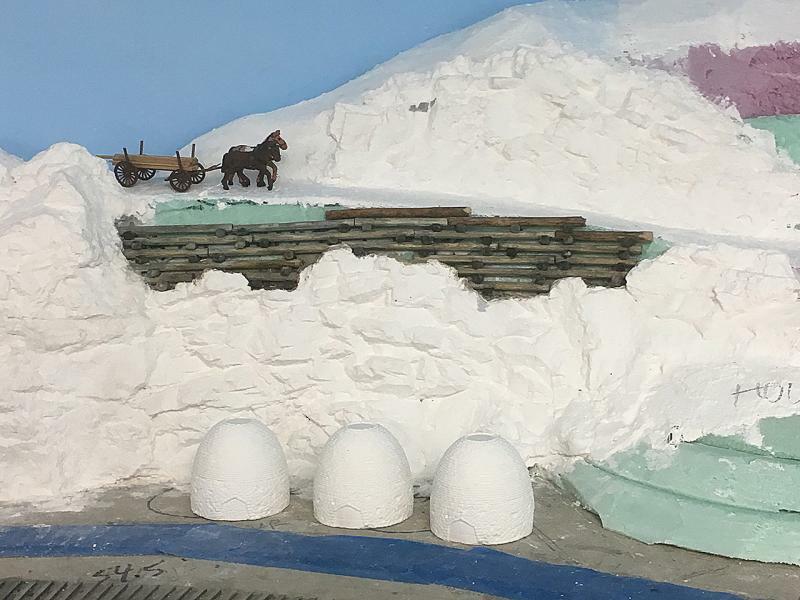 The plans for the Penn Mill were from Mike Blazek. I decided to make a mockup because it looked complex to me and to get a better idea of how to draw the rest of the mill. His plans are excellent and was a great starting point. The trestle is to come. 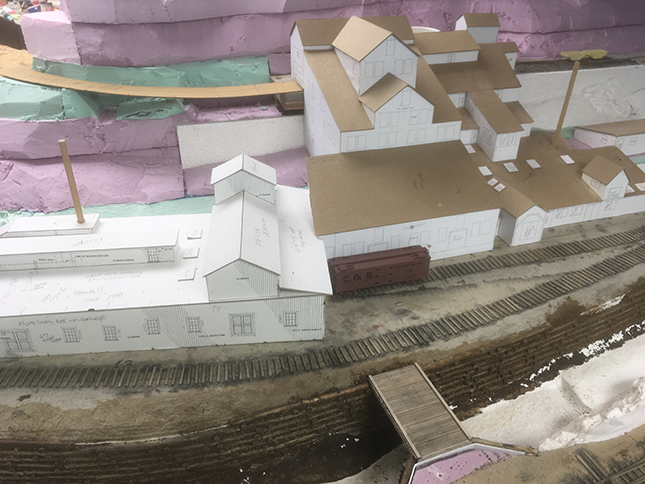 The addition between the two mills was made using a C&S 30 foot boxcar as reference from photos and relying on views in The Gilpin Era. It was definitely trial and error and constantly comparing views. The bridge of course was not there in real life but I liked the Clear Creek bridge and a compromise was made. At least it was a bridge that existed on the C&S. There's lots of windows and I lost count (or really don't want to count). You can see a shed now exists on the roof of the addition to the Iron City mill where coal can be loaded that was added sometime in 1912. Any idea if their would have been freight doors inside of the overhang on the Iron City mill close to the C&S tracks? Would they have loaded ore from here as it was part of the remodeled Iron City mill? I'm guessing the coal hatches are 4' x 5'. They look about the correct size from the photos. This is the other side of the complex showing the stone walls and the low single story building added later on top of the stone wall. Two stub switches have been made from code 40. You can see one of the vats from behind the building. I added a C&S style stone wall to the other side of the bank of Clear Creek. Just couldn't keep going on with the log retaining wall. Been avoiding making turnouts for years but found out it wasn't so bad after all. And there's that H type bracket or whatever it is on the top of the little two story building by the Gilpin tracks. but I've never made a mockup before but found it was extremely useful because of the complexity of the buildings. That looks about 100 s AWESOME ! You're gonna HAVE to start a New Thread with that great build underway ! Really want to hear more about it & see how you get on. It would be great to see all the research photos & stuff in a New Thread as well. You could probably Paste over what you have put here as a start. Is your model HO scale Kevin ? ... You didn't actually say. You have hit a home run with, first you muck up. How large a space does the complex fill? I agree Mike’s plans are outstanding. Do you have the complete set of Gilpin Books from Mike. Very nice creek retaking wall. Just a guess, but the tall structure above the mill could have been a transformer building. The H fitting appears to have power lines going to it. From what I've seen of various mill's, the transformer building or yard were usually located away from the main building's. 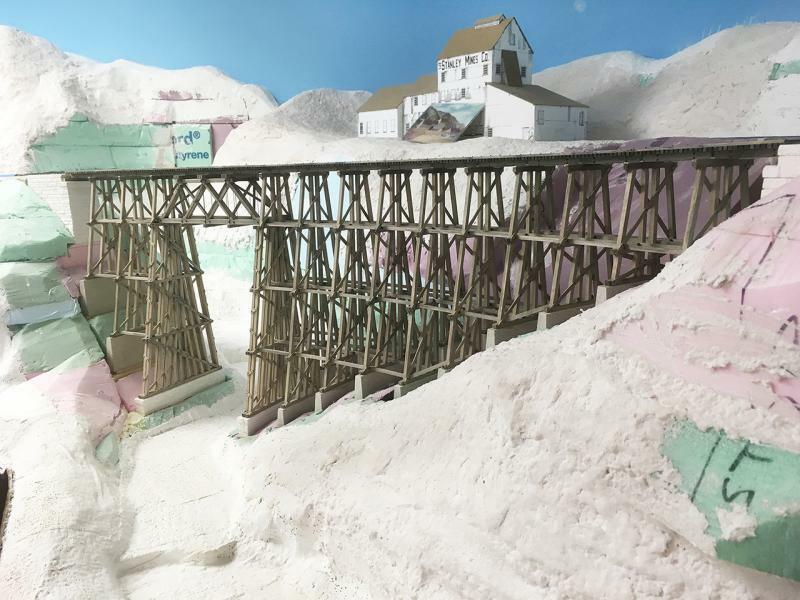 I model in HOn3 with HOn3 for the Gilpin tracks for the mill. From end to end the model takes up 3 feet 7 inches or a little over 109 cm for the rest of the world. I will try to post on another thread that I had already started but in the wrong location because I didn't know what I was doing. just some plans but am relying on reference from the two Gilpin books and Keith's thread. I moved your original Thread into the 'HO Narrow Gauge' Forum HERE. Also pasted your Post with photos in ^^ above for you. Also pasted in your replies above ^^ here as well. You can of course EDIT any Posts, if you wish. I just pasted over what you'd done, as a good start. Please Post LOTS MORE as well. I'm sure we could all stand to see many more angles & descriptions from your ACE mock-up ! If you want to change the TITLE and SUB-TITLE of the Thread, just ask. You might have some different ideas now. Personally I like to see full names like 'Colorado & Southern', not just C&S. Just me though, maybe you think the same, let us know. You have captured the mill perfectly. I have the Trains of Texas O scale Iron City Mill but it represents the mill as built. I have yet to start it as I am still debating if I should do a full interior with all of the stamps and machinery. Where did you get those beautiful rock wall castings? The answer is I cheated! I have grouped all steps in the following photo. like the small wall in the photo. All of his products have the most realistic stone castings I have seen. I used the Dry Stacked Wall (small) for HO but the Dry Stacked Wall (large) has larger stones and would be appropriate for larger scales. 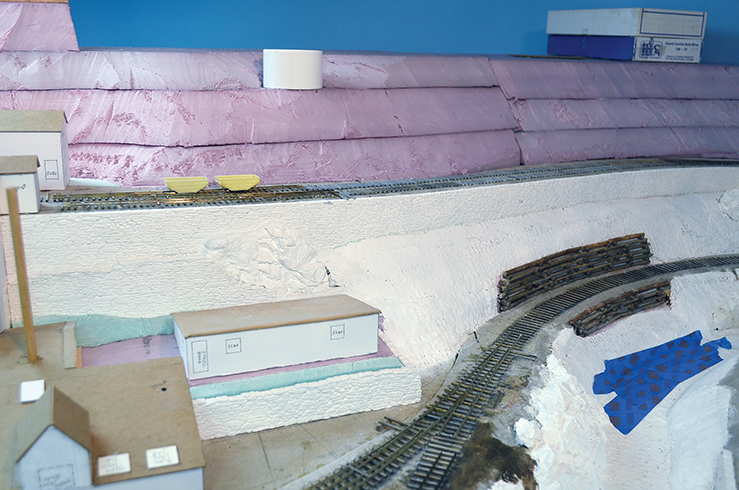 I glued them together in a straight line on a section of track where I intend to have a straight stone retaining wall. I then filled in the gaps where the pieces joined and carved to make it appear as one wall. 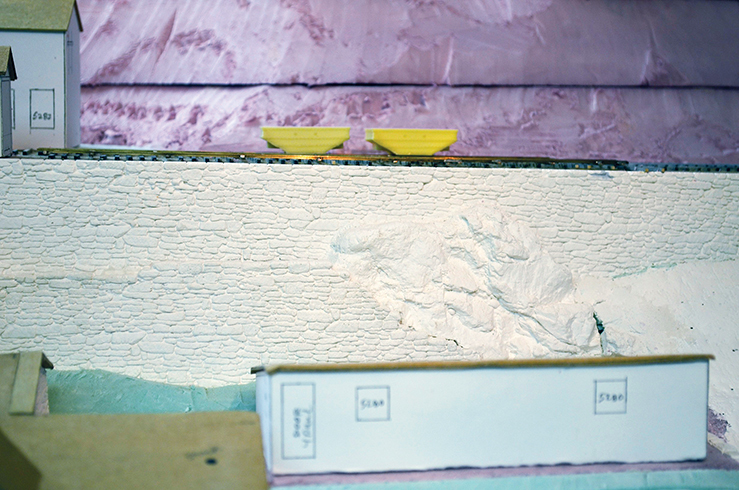 Next I made a latex rubber casting of the long wall in the same way as making a rock mold casting. I found the radius of the wall I needed for the track which in this case was a 20º curve. making sure I had a slight angle to the wall so I wouldn't have a 90º vertical wall when finally in place. Hard to see in the photo but the usable part is on the bottom side. poured in some Hydrocal and let it set overnight so that it would not break when I took the casting out of the latex mold. and I think another curved section section, patched between sections and done. 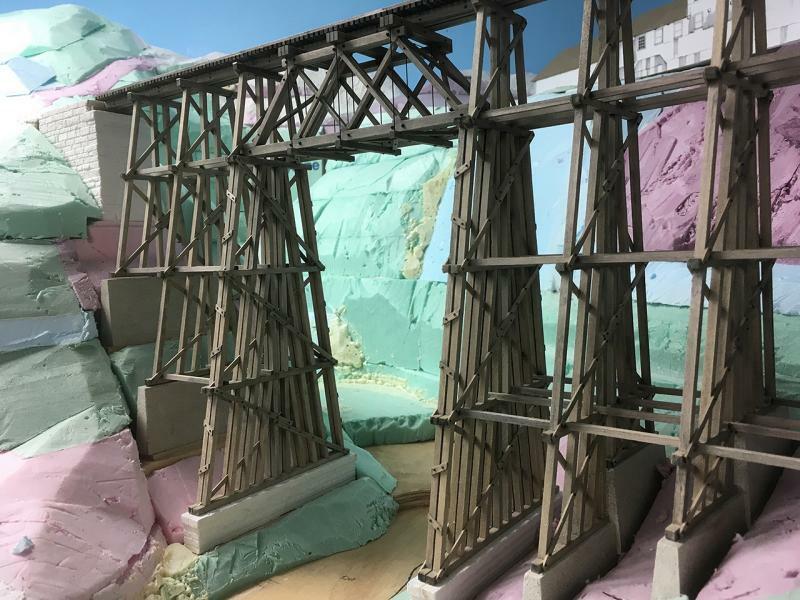 There is additional stone wall in front of the higher track wall you can see in some of the photos Keith posted. The top of the lower wall runs into a large rock. The top of that wall is not finished with a straight cap like the top of the track wall. Hope that helps and hope this gets posted before I lose power. Nor'easter in progress outside with 50 - 60 mph winds. Power already lost a 1/2 mile away. Si, you can change the subtitle from C&S/Gilpin to Colorado & Southern/Gilpin. 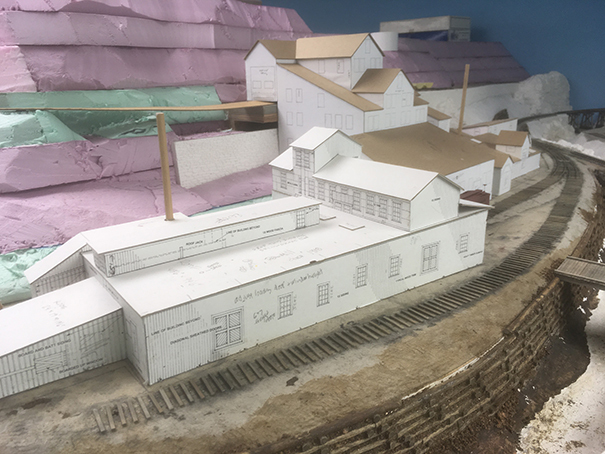 The mock up of the mill complex looks huge and a lot of modeling work. But with the results you showed so far I'm sure it will look great. I am going to order some of the NE Brownstone walls and see what I can get to work in O scale. I am looking forward to some more photos of your progress. 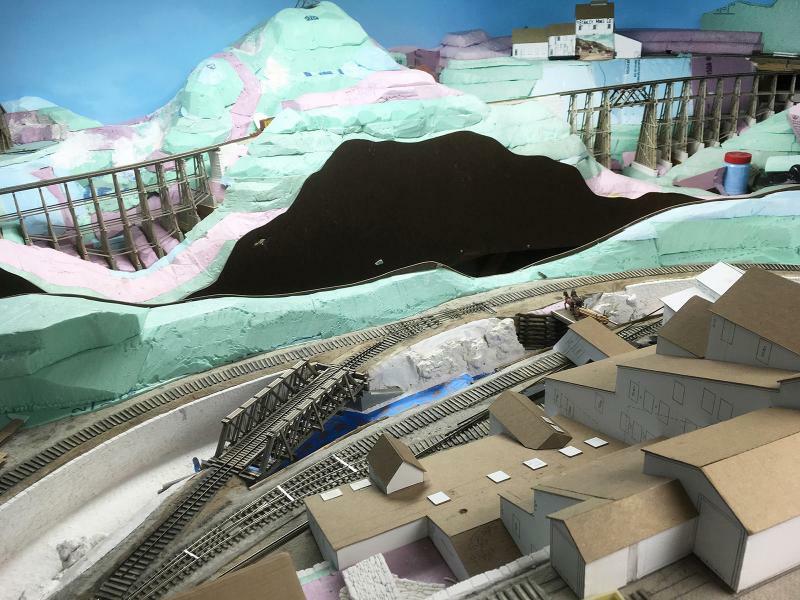 Here is an update on my layout. I tend to move from one project to another as I get bored and want to see results. 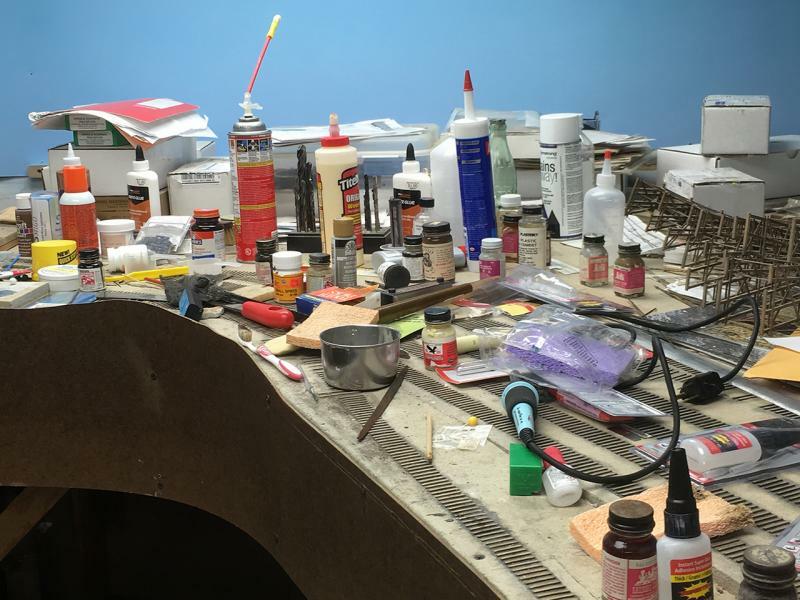 One thing that is not organized is my workbench which is currently on my layout. 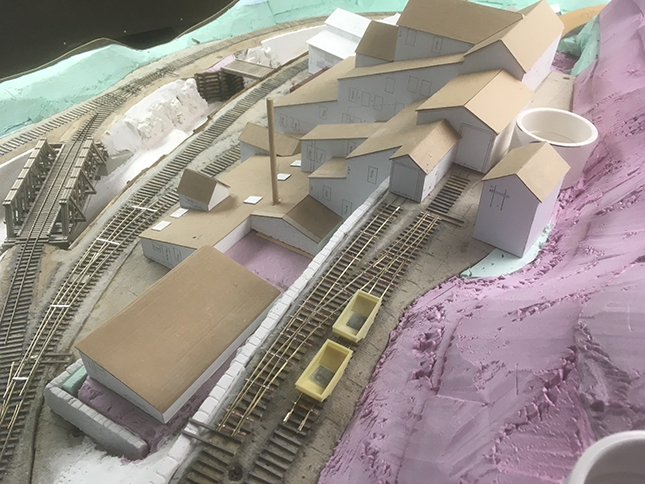 This is the main yard area where the roundhouse will be and the largest town, well someday anyway. I am now working on scenery. 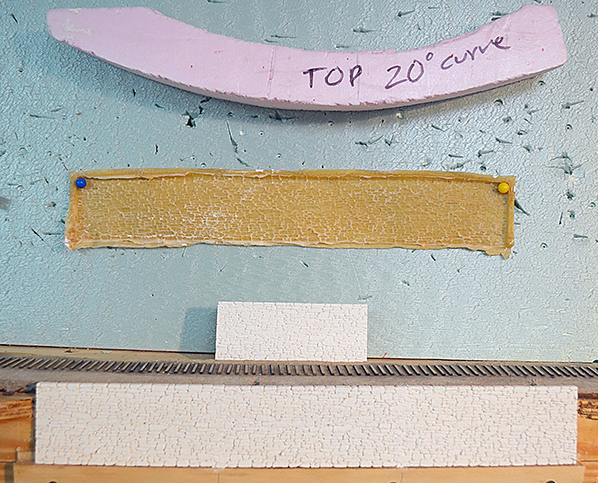 I use foam insulation as a base as it is easily carved although it can make a mess. Then I cover it with Sculptamold, rock castings or plaster cloth. Here is a view of two trestles in the distance before being covered with anything. which means rough scenery only as long as it won't interfere with any wiring or with building switches. And after it was covered with Sculptamold. The track closest to the viewer is the Gilpin HOn30 trackage to the Frontenac mill. I need to cut back the log ties and the throw bar on the stub turnout as this is not quite working yet. Here is the large trestle going over what will be a river. but I liked it as it is a smaller version of what modeler Earl Smallshaw had on his layout which I first saw as a 15 year old. He lived close by and I made many visits throughout the years. 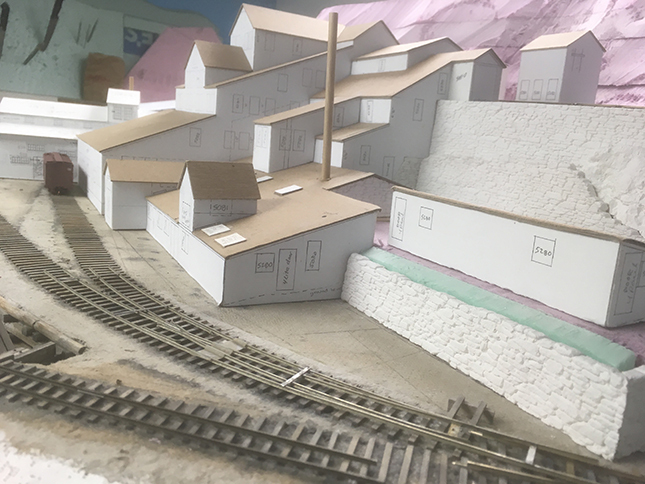 I made a mockup of the Stanley mine from Harry Brunk's plan in the Gazette. I originally planned for something else to go here but changed my mind and like this better. I think that cloud painting is next on the list before I get to the backdrop painting of hills while everything is still accessible. And here is a closeup from below. and will need to be sanded down and then weathered. They will mostly disappear when covered with rock. Here is the small trestle. I am scribing in lines to represent the board forms for the concrete. After weathering you will barely see them but I can sleep better at night. Ha! The mine was not on the C&S but I liked it. It is a Builders in Scale kit from many years ago and is still not complete. It needs cable to the tower and some other things. The buildings are just for placement. This is the smallest village and there will just be some basic stores. Here is the road leading in to town from over the hill. I am currently building a retaining wall which was very common to the area. The coke ovens are from Trains of Texas. I had been trying to find an HO version of these for at least 20 years. I just found some on eBay by sheer luck.